Leaving your current job shouldn't result in a damaging future career hangover. 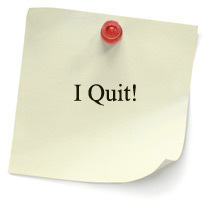 This article shares the important strategies behind quitting right, together with a short resignation template letter. 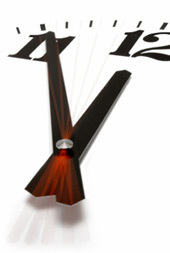 Whether you're in your first or your thirty first job, sooner or later it comes around to quitting time. No, not that end of the day quitting time when you log off to go home. We're talking about leaving your job for good. If you've handled yourself well, they're begging you to stay rather than telling you not to let the door hit you in the bum, on your way out. If you can't stand to wait any longer, then you may instead choose to follow Paul Simon's advice in the 50 Ways to Leave Your Lover: "You just slip out the back, Jack. Make a new plan, Stan etc". Scroll down if you would rather just copy our job leaving resignation template letter. Sometimes it's really clear that a job just isn't working out. For example, when you're putting in sixty plus hours a week and getting paid for thirty five. Or your boss keeps giving the exciting responsibilities and projects to his or her pet employee. Other times, the signs are less clear and future prospects may be uncertain. So, what are some signs that it may be time to quit? According to the US Dept. of Labour, the average US worker will change jobs ten times in the twenty years, between the ages of 18 and 38. Some of those changes will be graceful while others won't win you any style points. The first thing you will want to do in practicing your leaving, is to anticipate your boss' reaction. Is your boss the kind that blows up with anger? Will you get a speech about how you're letting the company down after all it's done for you? You may luck out and hear that they're disappointed to lose you, but wish you the best for the future. Or on the other hand, that they would like you to leave the office immediately, and you will need to be ready to do so. If you can't be sure what the reaction will be, plan for all the possible scenarios you can think of. Try writing out the key things you want to say in the meeting and then practice reciting them. Have ready some responses to things they might say. Just like it's a good idea to come up with a list of questions you think you might be asked when you apply for a job, it's also a good idea to come up with a list of answers to questions you may need to respond to, when you leave. While not the ideal, remember that it is an option to state that you'd prefer not to answer any questions you're not comfortable with. The problems in quitting often come between the time you make up your mind to do so, and your last day of work. For that reason make this time period as short as is professionally possible. In the interim avoid some of the more common pitfalls. There's often a temptation to tell your best workmates that you are quitting before you tell your boss. This can backfire badly. If the news reaches your boss prematurely, you're likely to find yourself in a defensive posture which could strip you of any negotiating power . It could even mean that you are terminated instead of leaving on your own terms. Leaving too much time between when you tell your employer that you are quitting and when you leave, can be a bad thing. Many people feel that they're indispensable. This isn't always true, as many company founders have discovered. 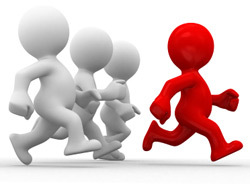 Feeling that you are indispensable may mean that you offer your employer too much time to find a replacement. Sure, you want to leave them some time to do so, but as soon as you announce your resignation there will be a power shift that could trip you up. On the one hand you may begin to feel that you are on the same level as your supervisor - certainly you no longer need or care for their approval. However, what is more likely to happen, is that your opinion and input will no longer be given the same weight it once was. Burning bridges is another pitfall. If your job has been a negative experience, it's natural to want to let off some steam. The danger is that you could be hurting your future career path in many ways - most of all when it comes to getting a positive reference. 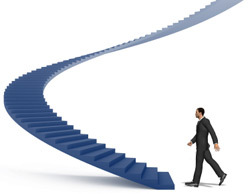 Not having a next step can be a big pitfall. Sure you're ready to go, you've been ready for months, but you've neglected one little detail - finding a new job . For most of us there is a mortgage or rent to pay, food to be put on the table or at least in our stomachs, not to mention student loans and credit card bills. So before you quit, look after number 1 first by finding another job. How should you leave? First be polite, courteous, and professional. Don't burn bridges on your way out. It's often better to be able to say that you're leaving because a better opportunity has come your way. As opposed to giving the message that your current situation is so intolerable, that another minute of it may cause you permanent mental or emotional damage. Give the amount of notification time you agreed to, when you were hired. If there was no agreement, use whatever is standard in your industry. Don't leave your employer in a lurch. If you have been working on a project, either complete the project, or the most crucial part of it. If time doesn't allow for this and you have key pieces of knowledge for its completion, make sure to pass on deatailed process diagrams and notes, to help whoever picks it up from you. If your future situation allows for it, offer to come back and help train your replacement. You could charge them a consultancy rate - which of course would be much higher than your current salary . The problem many people create for themselves in writing this letter is that they say too much. Don't say more than you need to. For example, you do not need to document anything negative about the company or your supervisor in this letter. You don't need to state why you are leaving, nor should you. As Dr. Melvin Luthy, Chief Editor for WriteExpress, points out, "Your resignation letter will be the final document in your personnel file. This means it will be the first document seen when a future employer calls for a reference, or if you reapply at your company." This makes it one of the most important documents in your personnel file, and it puts you in the driver's seat for setting the tone of such a reference. In essence, it is a great opportunity to "future proof" how you're viewed by the company. Here's an example of a resignation letter, written for a position that at one stage was a rewarding and good fit. Please accept this letter as my formal notice of resignation from XYZ effective X July 2011. My intention is to provide you with ample time to find a qualified professional to take over my position. My time here at XYZ has been some of the most rewarding and memorable years of my professional life. I sincerely appreciate the opportunities that I have been given to contribute to the company's success, while growing professionally and personally. A great resource for resignation templates is I-Resign.com. You'll find templates for resignation letters from moving to another firm, to leaving to have a baby. Chances are that sometime in your last week of employment, the company human resources department will request an exit interview with you. Be aware that you do not have to agree to this interview. Sometimes, for example if you're leaving due to sexual harassment, or other harassment, and want to protect your future legal rights, you certainly won't want to agree to this interview. More often than not however they are benign, and done right can certainly help the company improve and allow you a sense of closure. Most of the advice available on the web on exit interviews, speaks to the employer's side: how to conduct them, how to use them to improve the company etc. There is, however, a great exit interview mini guide for employees created by "Management for the Rest of Us". Here are a few sample questions that you can expect to face. What is your main reason for leaving? Would you work for this employer again? Would you recommend this employer to friends or family? What did you enjoy/dislike about your job? What improvements would you suggest about your job/working conditions/management support? What do you think it takes to succeed at this company? What does your new employer offer different to this company? The second and third questions on the list are closed questions (answerable with "Yes" or "No") and are therefore the most straightforward. Spend a little time before the interview coming up with the answers you want to give to questions such as these, and remember "No comment" is always an acceptable reply. You'll need to make a call on whether you think your company is conducting the exit interview because they want to genuinely learn and improve, or if it's merely a PR stunt, or to get some dirt you otherwise wouldn't have shared. If you don't trust their intention, you would do well to keep your criticisms to yourself. You could always bring your own questions into the interview. A telling question is: "What exactly will you be doing with the information I share with you?" You may have thought that quitting your job ended once you walked out the doors, and for the most part it did. However, if you left your old job before you had a new job, the end is still around the next corner. Also, consider what will happen if your new position doesn't live up to it's promise. Your goodwill and letter of reference from your employer, will be a bankable currency you would do well to have notched up. Keep in mind, as you go into job interviews , that no prospective employer, even if they are your former employer's competitor, likes to hear you talk down the people or the job you just left. In fact, CareerJournal refers to this as what may be "the ultimate interview offence." It suggests you may do the same if and when you choose to leave your new job. You will also want to make sure that it is safe to offer your former employer as a reference. It's not unheard of to have a friend or employment service act as a prospective employer by calling your current employer to see what type of a reference you'll get. Even if your employer is a big corporate company with a policy of issuing standardised, sanitised, factual references, and you run no risk of the letter tarnishing your career trajectory, there are other dangers. 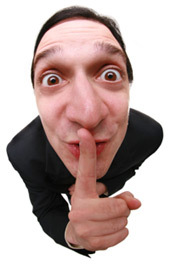 Some future employers may insist on talking directly with your previous employer. Even after you're in your new job, continue to put your best foot forward by not talking about the situation you left behind. If you handle everything well, the transition will be seamless. You'll maintain great references from your past employer while building your resume in your current situation. We welcome the republication of this page's contents in part or full - we just ask that you include a clean link back to this site, to our www.negotiationtraining.com.au/training/ page. "Informative and well presented - Thank you very much"
"Read carefully it is nice to follow but don't follow blindly.Act according to situation.Try to be poilite,but don't go on back foot.If you give promise to new employer, for sake of more money don't stay with current position.If you have no complain with current employment,stck to it.If you are confident to be sucessful and wish to do somthing different, look for new job." "David, your thoughts are very insightful and helped me come to terms and actually enjoy the final days of my employment with my company. All the Sh*t that I have had to deal with and incompetent managers. This is a business desicion, and nothing more, one that looks after No.1. Thanks for the advice. Extremely helpful "
"Thank you for making me feel better in my decision to leave a job I love but is going down hill due to financial reasons. I have found an equally credible job and hope I will love it as much but was torn at how to leave my company. This has definately helped!!!! Took a load off of my shoulders." "Good information. Very well presented." "I&apos;m in an apprenticeship and feel bound to my current job as they are training me. this article put a smile on my face and gave me great info. It&apos;s nice to be reminded that people do quit... wish me luck"
"I felt guilty about leaving my last employer. Guess being young means I feel obligated towards them for training me up and investing in me. Turns out they were planning to outsource my department for a while, and never let us know until the final month. So I now look after number 1, just like this article states. Not having a wise old person to advise me, this article is the next best thing." "I found the biggest limitation in my job search to be the number of people that I could reach out to. I then heard that social networking sites were the new hotbed for recruitment and started spending a lot of time on sites like linkedin and toplinked. I've started connecting with some influential and potentially valuable people but would still like more tips on the subject as I've not yet found exactly what I am looking for. Would be great to see such an article here. Thanks"